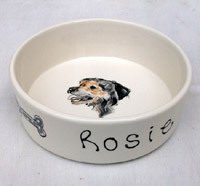 Ceramic dog bowl beautifully painted with your dog's portrait and personalised with their name. 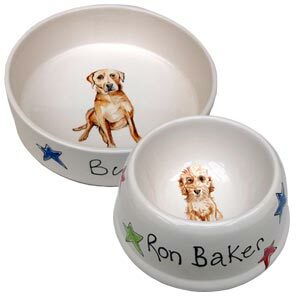 These bespoke dog bowls feature a wonderful portrait representation of your dog from the photo you provide, painted onto the inside of the bowl. 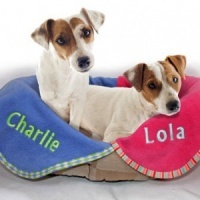 The outside is personalised with your dog's name and decorated with rustic stars in red, blue, yellow and green. No transfers or cheap shortcuts. 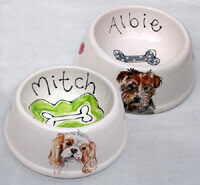 Each bowl is carefully hand painted just for you. 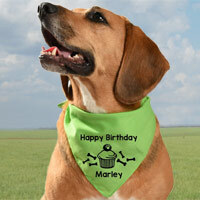 Wonderful gifts for dog lovers and dogs who appreciate fine dining. 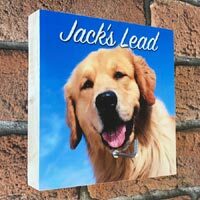 Sure to be treasured for years to come. 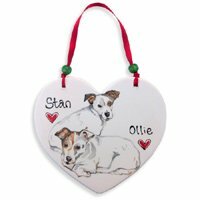 Created for you and your dog at a pottery studio near Cheltenham using materials from UK companies. 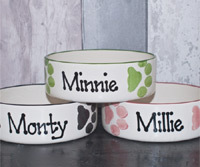 The fun character illustrations are hand painted onto high quality earthenware pottery which is then glazed and kiln fired at 1200 degrees producing a permanent finish which is also dishwasher safe. 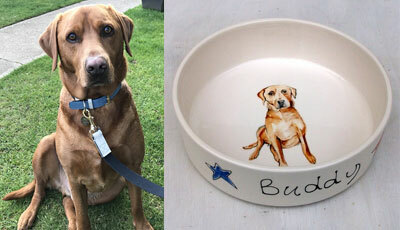 These customised bowls are really special and something you won't find on the high street.